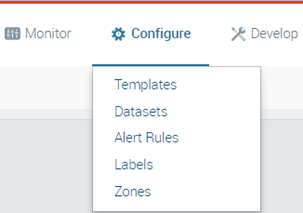 The Configure activity helps you to create and manage templates, system datasets, alert rules, labels and zones. Templates: create, edit and review templates used to configure systems. 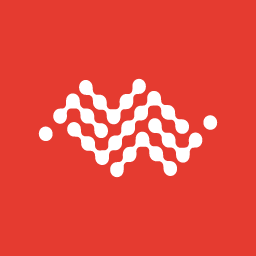 Datasets: create, edit and review datasets used to retrieve on demand or periodically data from the systems. Datasets are also used to export data from AirVantage to .csv files. What is an Alert Rule? An alert rule is simply composed of a set of up to 10 conditions. The alert will be raised if all conditions are satisfied. 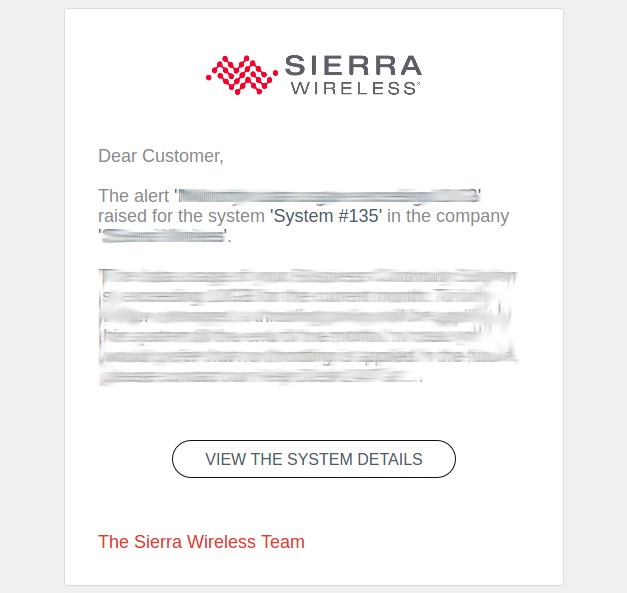 Once the alert is created, you will receive a notification when the alert is raised for a system, and then when the alert is over and the system working back the expected way. 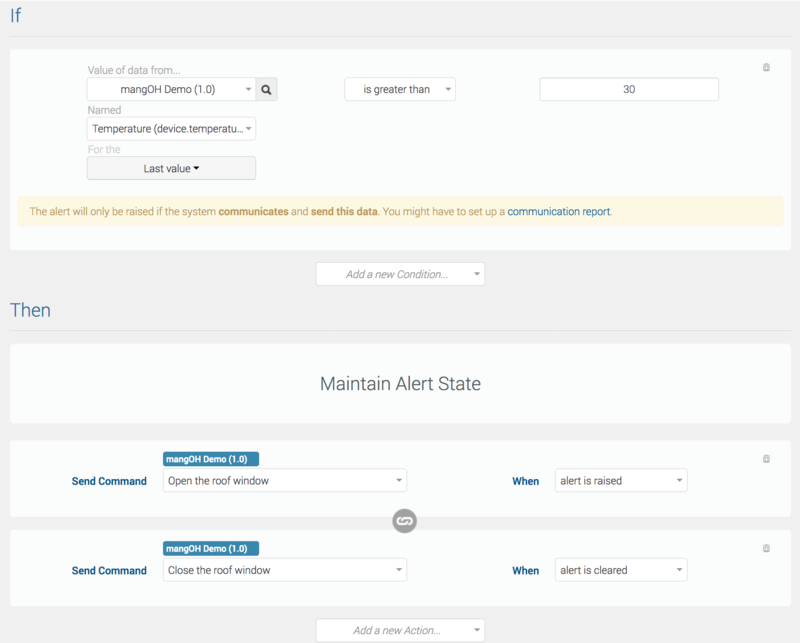 Some alert rules templates are proposed to you as examples with pre-filled conditions to create your own alert rule by changing values or adding more conditions. The custom template is a template without any pre-filled conditions. 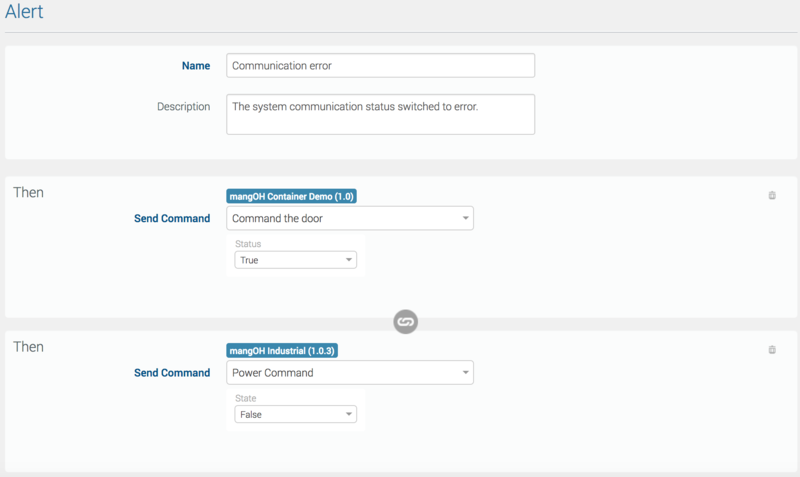 Here is an example of configuration, that raises a “Communication status goes to error” alert and sends an alert email when your system communication goes to error. With ‘System has label’ and then choose the label of choice to have the alert rule on part of the company fleet only. When creating or editing a rule, you can specify one or more actions to be launched on the specific system that causes the alert to be raised (i.e when the rule’s conditions are all met). The action will be triggered as soon as the alert is raised and on the one and only system that was at the origin of the alert. For some actions (send command, apply setting) an action can also be applied when the alert is cleared (i.e when the rule’s conditions are not met any more). The action that can be taken when the alert is cleared can be different than the ones when the alert is raised. Use Case 1 If my month to date airtime consumption is over 10 GB, then apply an AirVantage template that will throttle my data usage on the device. At the beginning of the next month (when the alert criteria are not met any more) apply a second template to unthrottled the device. 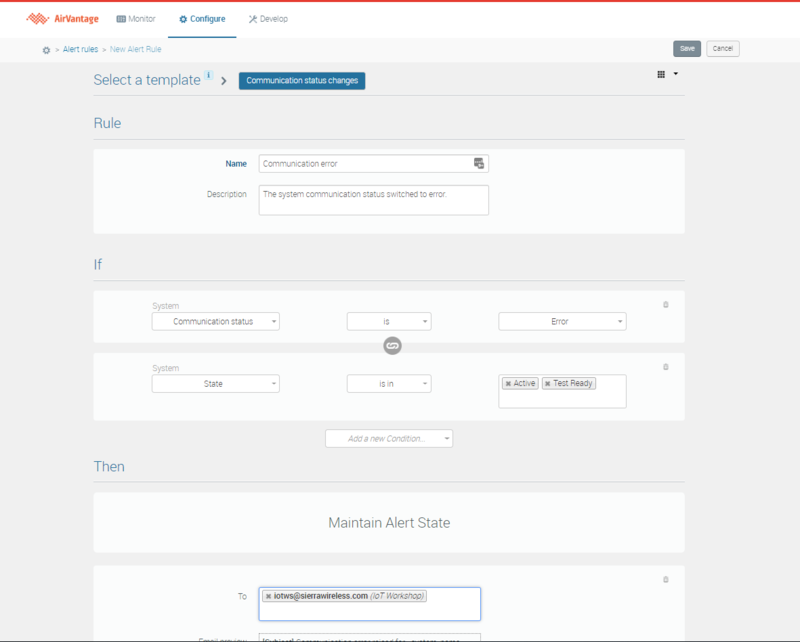 Note, in this situation it is critical not to disable communications entirely, or the device will not be able to communicate with AirVantage to remove the new template when the alert rule clears. If the outside air temperature measured by my device and sent to AirVantage is higher than 30°C then raise an alert and send the command ‘open the roof window’ to the device. When the alert is cleared (i.e. the temperature drops below 30°C), then send the command ‘close the roof window to the device. 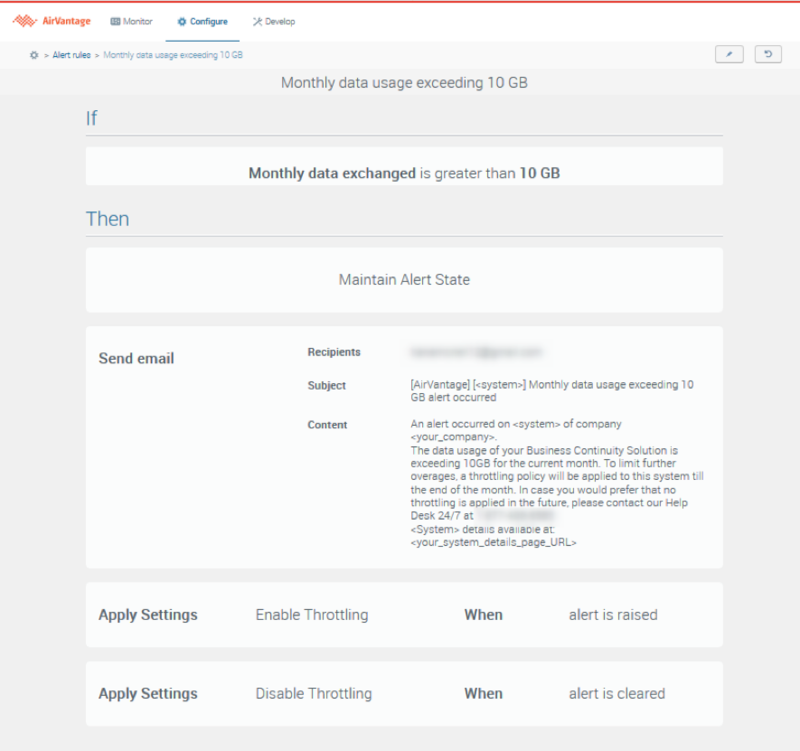 You can decide whether or not to receive an alert notification by email (for more information, see How to configure an alert rule? ). When creating or editing an alert rule, you can specify one or more urls that will be called every time the alert is raised. Those webhooks permit to inform a third party application about the alert raised in AirVantage. Webhook is a stateless mechanism and messages are sent in JSON format with the content-type “application/json”. Messages sent to an unreachable endpoint will be lost. This action sends a command to the system which raised the alert. The command will be get by the system in the next device’s communication with AirVantage. You can define one or more Send a command actions. This action applies a pre defined template to the system which raised the alert in order to configure your machine according to the context (initialization, local user action, new local status, issue detected). This template will be applied in the next device’s communication with AirVantage. You can only define a single Apply settings. You can apply a label on systems that have raised an alert on a specific rule. The label will be automatically removed when the alert will be cleared. This can be used for example to identify from the grid all systems being on alert on a specific rule. The Labels section displays the list of labels created for the company you are working on. User can create any label, they are used to group entities like systems. The Zones section displays the list of zones, or geofences, created for the company you are working on. The zones listed are available to use in your report definitions. You use zones to include or exclude results when generating reports. For example, if you have a defined territory and only want to know if a vehicle has left the area, you could create a report template with your territory as an “Excluded” zone. This would generate reports that showed any vehicle activity outside your territory. You can view, clone or delete zones from the list, or begin creating or importing a zone. How to create a dataset? How to create a new alert rule? How to delete a template or dataset?